New Rochelle, October 6, 2016–Tensors and tensor decompositions, a powerful set of new data mining tools that can be used to model and extract knowledge from multidimensional data, can be automated for more widespread use in Big Data applications. The effectiveness of these innovative tools in a variety of data modeling scenarios is demonstrated in an article published in Big Data, the highly innovative, peer-reviewed journal from Mary Ann Liebert, Inc., publishers. 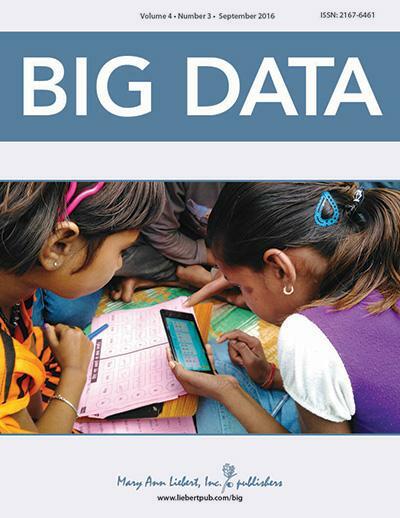 The article is available free on the Big Data website until November 4, 2016. In the article "Unsupervised Tensor Mining for Big Data Practitioners," Evangelos Papalexakis and Christos Faloutsos, Carnegie Mellon University, Pittsburgh, PA, describe the urgent need for mathematically rigorous methods to analyze many different types of complex, multiaspect data. A tensor–a multidimensional matrix–is ideal for modeling multiaspect data, such as social interactions, which can be characterized by the means of communication, who is interacting, and the time and location of the interaction, for example. The authors discuss the challenges presented by many current Big Data scenarios and describe their recent work to develop a solution that automates unsupervised tensor mining to facilitate its use in industry and academia. "Data scientists need to take stock periodically about advances in machine learning methods to stay current. This article explains one such method involving the analysis of tensors and its potential applications, " says Big Data Editor-in-Chief Vasant Dhar, Professor at the Stern School of Business and the Center for Data Science at New York University. "In particular, the major challenge we face is the extraction of knowledge from massive amounts of data represented as tensors. Papalexakis and Falutsos do a great job of outlining these challenges and providing solutions to them."